At any one time, there are tens of thousands of missionaries who have been sent out from North American churches and parachurch missions agencies. Each one has a story to tell. The PAOC has had, and continues to have, its share of missionaries and their stories—from Austin Chawner (Africa), to Ken McGillivray (China), to Mark and Hulda Buntain (India)—apostles and ambassadors for the gospel. Most recently these heroes of the faith include the autobiographies of Frank M. Juelich (Fearfully and Wonderfully Mad!) and John Abraham, whose autobiography, Living in the Supernatural Dimension, is the subject of this review. John Abraham’s book is the story of 60 years of global evangelistic ministry. Abraham grew up in a devout Northern Ireland Plymouth Brethren home. At age seven he prayed the “prayer of salvation.” Ironically, when he was 10 his father whipped him for leading one of his childhood friends to become a Christian. This was because, according to the father, he was too young to do this. However, by age 12, he had become a children’s evangelist doing DVBS work. For six years, beginning at age 13, he and a group of like-minded teenagers conducted evangelistic crusades for adults. At one of their meetings, circumstances forced him to pray for a lady with a large goiter and, contrary to his expectations, God healed her. Ultimately, this led him to experience his own Pentecost, which created significant opposition and hostility within his Brethren community. Through his acquaintance with Canadian evangelist John Wesley White, Abraham came to Canada for his theological education, attending Full Gospel Bible Institute in Eston, Saskatchewan. During this time Abraham made a point of attending the Billy Graham crusade in New York for several days (1957). In regard to his perspectives about doing evangelism, Graham’s “Big Apple” crusade provided Abraham with a lasting template or pattern for his own ministry. After graduating from FGBI, he became as associate evangelist of John Wesley White, working with him back home in Britain. Working with John Wesley White—the rookie evangelist with the seasoned and successful veteran—proved to be an education in itself. A major part of his job description was to do advance committee work with churches, preparing them for their part in a forthcoming citywide crusade. But he also learned about being an evangelist: his prayer life; devotional and personal Bible reading; doing personal as well as crusade evangelism. These and other lessons were an essential part in the maturing of Abraham the evangelist. During this time an invitation came to Abraham to return to FGBI one October to be their guest convention speaker. This resulted in a bundle of requests for Abraham to hold meetings in various churches in Canada, and this became a fork in the road, from which there has been no turning back. Later, in 1986, Abraham faced another fork in the road and committed himself to a permanent missions evangelism career. 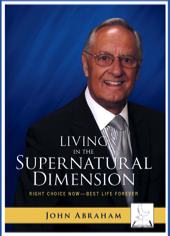 Abraham’s book Living in the Supernatural Dimension is an amazing narrative whose stories are gleaned from 60 years of national and international evangelistic ministry. It reports his arrest and interrogation as a suspect in England’s Great Train Robbery. It reports healings, reconciliations and conversions. It reports miracles of nature during hurricanes and tsunamis. It reports a gift of “water from the rock” and divine care and protection when important travel, money and contact information were lost. It also reports dreams, visions and the tangible aid of angels. Abraham’s skills as a storyteller are far better than are often found in many missionary autobiographies, and many readers will find it unputdownable. It will challenge, encourage and inspire its readers to experience for themselves living more fully in the supernatural dimension. Abraham sums up his ministry as follows: “In a lifetime of ministry that now exceeds fifty-two thousand gospel presentations, with approximately three million individuals praying a salvation prayer, with hundreds of churches planted and tens of thousands of pastors and leaders trained in leadership schools and seminars, I only recall two failed (so-called) events in missions evangelism” (p. 133). But who’s counting? The evangelist who learned his crusade “template” from Billy Graham and who apprenticed as an evangelist with John Wesley White. Roger Stronstadt, M.C.S. is associate professor of Bible and Theology and Dean of Education at Summit Pacific College (formerly Western Pentecostal Bible College) in Abbotsford, BC. He is author of: Models For Christian Living: A Commentary On The First Epistle Of Peter; The Charismatic Theology Of St. Luke; and Spirit, Scripture And Theology: APentecostal Perspective.